The forest and Mahagenco officials have reported that five tigers have made the Chandrapur super thermal power station their home. 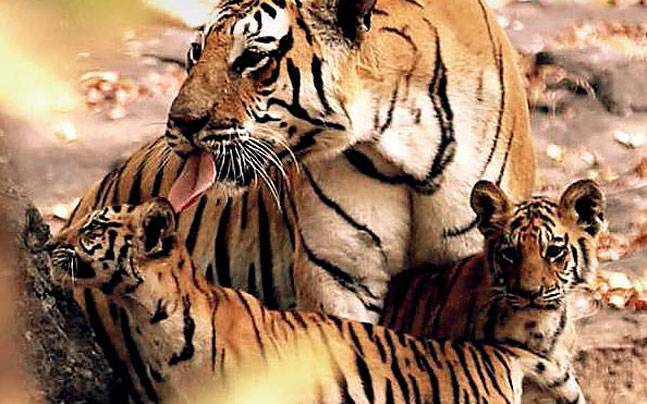 A tigress and her four cubs of the age probably two years have been sighted in the bushy areas of the thermal power station where they have been living for more than 18 months. The officials have no clue what brought the tigress there and why she hasn’t left the place yet. Santosh Tiple, range forest officer, was reported saying that the family of the wild has been living in the thermal power station for about more than 18 months and they have been familiar with the human presence. But, till date, there has been no conflict reported by the officials where animal and man interface was seen. The animals do not get bothered by the human presence which is great news, but it cannot be said that there will be no such case in the future. Santosh also said that the bushy areas were towards one corner of the sprawling 11,000 hectares CSTPS premises and it consists of thick vegetation consisting of grasses and weeds. The residential buildings of the respective employees are, however, situated 5 km from the area which is a safe distance to estimate but the authorities are concerned. M A Parchake, the CSTPS deputy chief engineer was reported saying that the maintenance staff has to vacate the area as soon as possible to ensure the safety of their lives. When the chief engineer was asked what will happen when the cubs are separated from their mother, he said, tigers do not have any fixed guidelines to follow. They have their ways to deal with situations, and so it is possible that they will find their way out. When A K Mishra was asked if he feared any animal-human conflict would take place, he said, the CSTPS authorities have been informed to take certain preventive measures such as de-weeding the area, and ask people not to enter the area because mishap can happen anytime and maintain the bridge of gap in the compound wall. There are some meat shops in the nearby locality as well, and they are to be removed as well. Chandrapur city has been familiar with tigers moving around freely because the area is thickly loaded with greenery and forests. This makes it possible for the cubs to venture other areas to carve their territories in future.